Like many of you, I am a collector, a saver, a…dare I say it?...packrat. There are many things I can’t bring myself to throw away, including greeting cards. So I really wanted to figure out a way to remember the cards, but to weed out my collection somewhat. Framed is the result. It’s so much fun to be able to take greeting cards that you enjoyed receiving and recycle them into jewelry that you’ll now enjoy wearing! Polymer clay, an exacto knife, and some greeting cards with pretty designs are what you’ll need to get started. I used a Christmas card that I received long ago to make this necklace. 1. 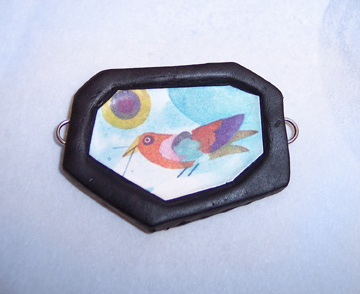 Condition and roll out the black polymer clay on parchment paper to a sheet approximately 1/8 inch thick. You can run your clay through a pasta machine if you want to, but having each link the exact same thickness is not critical. 2. Cut small pictures out of your greeting card with the exacto knife. Mine are all 1 to 1 ¼ inches lengthwise, but the size is up to you. 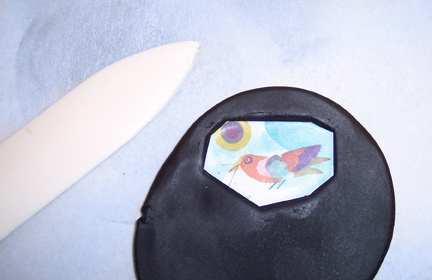 Lay one picture onto the sheet of clay and use the bone folder to sink it down into the clay. Push and smooth it down into the clay until it is recessed by a millimeter or so. 3. 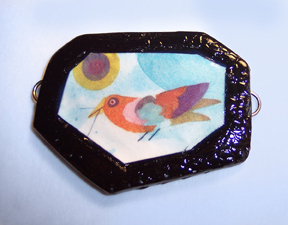 Cut the polymer clay around the picture with the exacto knife, leaving a narrow border. Smooth the edges with your fingers. Cut a slit in each end with the exacto knife and insert a jump ring half way into each slit. Smooth the clay closed around them. 4. Repeat these steps for each of the remaining links, plus make a smaller link for a dangle at the end of the necklace chain if desired. I made seven links plus the dangle. 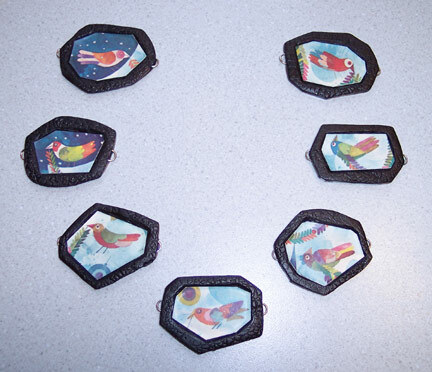 Use your rubber stamp to add texture to the frames if desired. 5. Place all the links on parchment paper on a cookie sheet. Bake as directed. Exact times and temperatures vary depending upon the brand of clay used. 6. After the links have cooled, use a small paintbrush to coat the tops of each with either 2-part epoxy resin or with a clear coat finish like Diamond Glaze. Make sure the recessed wells that you created with each picture are completely filled with glaze. Let them dry thoroughly. 7. To assemble your necklace, use jump rings to attach all the links together. Cut a 7 inch chain bracelet into halves, and use jump rings to attach the chain pieces to each end of the links. Attach your smaller dangle to the free end of the chain. 8. Decide which greeting card you’re going to cut up to make your next framed necklace! What a great idea! Besides cards, I'll bet heavy wrapping paper would work too? You always have the coolest ideas! P.S. I stumbled this post , too. It's just too clever!! Thank you Cherie...I appreciate it! Oh Cyndi... you know, every time I start to throw something away I think of your "rescuing landfills one item at a time" mantra... so I blame my pack-rat ways on you...LOL. 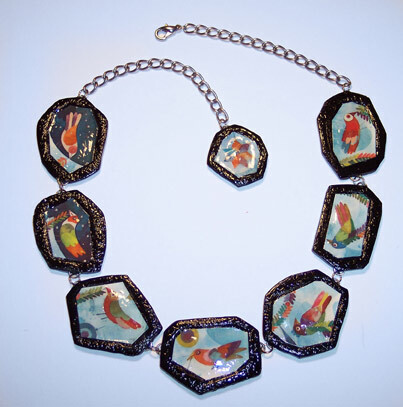 But things like this are exactly why, what a great way to make a gorgeous one of a kind necklace AND recycle something! What a great idea, Cyndi! How clever to recess the images to make a dam for the glaze.